I would like to clean up and polish my 7-year old boat. All in all, its is pretty good shape Other than a few weeks during the summer, the boat stays in the trailer. I plan to clean up the bottom with MaryKate On and Off hull cleaner. As far as the rest of the boat goes, I plan to use Marine 31 all in one. I also have array of Wolfgang products for my trucks. My question is, if I use the Marine 31, should I use wool pads or some of the white or orange foam pads? I will be using a Griots 6" polisher. Any suggestions on how to get this cleaned and polished? I really depends on the condition of the gelcoat and the results you are trying to achieve. I did a gelcoat with Marine 31 AIO and it required 2 passes to get it the way I wanted it. The first pass with LC wooled foam pads and the second pass with LC CCS orange pads. If you are purchasing pads get yourself both, it's always good to have options. Also be careful around the tie down cleats and others "things" hanging off the boat - you DON'T want to hit them with the rotating polisher. The gelcoat is in pretty good shape. Just trying to buff out some small imperfections and add some shine. Never having used wool pads, is the Lake Country wooled pad a 6.5 inch purple? I have tons of white and orange LC pads. When removing oxidation off gel-coat you will get better results faster by using any form of FIBER pad. 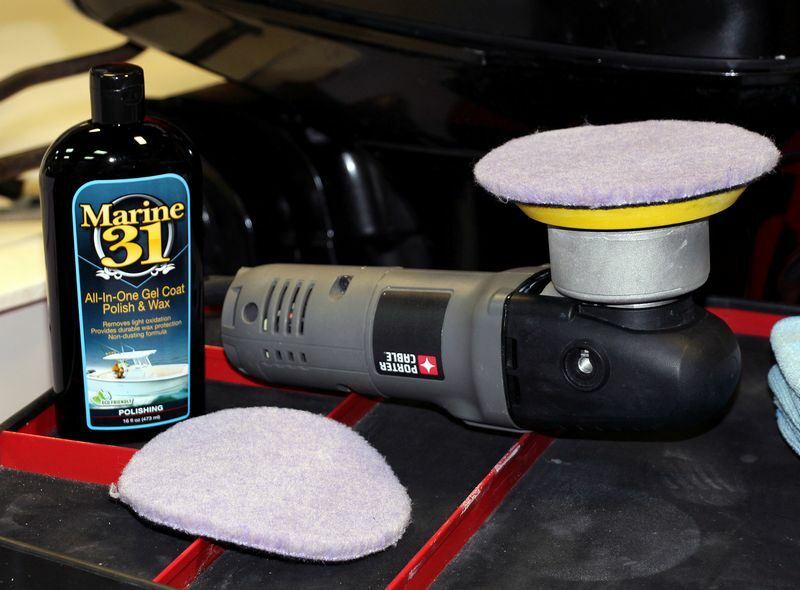 The fibers act as a form of abrasive and toghether with the abraisves in the Marine 31 All-In-One Gel Coat Polish & Wax will cut, polish and seal in one step. From my experience - foam "polishing" pads can actually DULL gel-coat. I wrote this in my book too. Gel-coat likes HARD sharp pads. Fiber cuts better than foam. There's a LOT of thin fiber pads on the AG store, I don't have time to look them all up but for the most part, any of them will work to cut off oxidation. Avoid the actual "microfiber" pads and get pads that are just short pile length, thin wool pads. Worked very well at removing dull gel coat, and then I followed up with orange LC CCS pads and got the boat looking much better than I expected. Of course this was an all-day affair, so plan accordingly. Oh, and a good portion of the work will be done overhead, so make sure you have a nice platform to work from. Working from a ladder will be much harder from a balance perspective, and you're going to have to move a ladder quite often. I bought a nice platform from Home Depot for under $ 30 if I recall properly. Makes the job much easier. i was lookig at the Lake Country Foam/wool purple cutting pad. Yes they will work. Be mindful of heat. If you're buffing for a long time without breaks all the heat is transferred from the spindle to the backing plate to the pad. This is normal --> heat generation. You will work faster and your pads will last longer over time if you have extra pads so you can switch to a fresh pad often. I just know from experience heat is an issue and because the fibers don't really hold the heat the only thing left to hold the heat is the "backing material" of the pad. So feel the center of the pad once in a while and check to see if it's HOT. If it is, switch to a different pad. Here's my article and video on this topic. This is in the context of any free spinning orbital polisher. (any brand) You will find some guys that will try to make the case that the pad doesn't have to rotate and if all it's doing is vibrating against the surface it will remove swirls or in your case oxidation. On a free spinning orbital the pad MUST rotate to do work. Period. I don't do as many boat detailing projects as I used to because no one seems to care. Takes a lot of time and work to make the magic happen. But if know one cares then no reason to do them. Here's a boat detailing project from the year 2013 - in it I photo document the project, (no one does this anymore), and you can see the Lake Country PFW pads in action. McKee RV all in one for marine use?